HOMEEver wondered about an MRI scan? Ever wondered about an MRI scan? Magnetic Resonance Imaging (MRI) Scans have become more popular in recent years. Being a non-invasive and painless procedure, they are safe for both children and adults, and don’t involve any radiation exposure. MRI scans provide detailed images, taken in sections through your body, to show abnormalities in your bones, organs and soft tissues and are also very effective in helping to plan and monitor your treatment. These detailed and intricate images of the body are far superior to those produced by X-rays or CT scans and allow for thorough investigation and quick diagnosis of a wide range of conditions. Although their use is becoming increasingly common, the mere thought of an MRI scan sends many into a state of anxiety; largely due to the fear of feeling claustrophobic. The idea of being slid into in a large, noisy metal tube, can be a test of the nerves. However, the accurate diagnosis achieved from MRI scans means that they are a vital step in the identification and treatment of many illnesses, injuries and conditions. Avicenna, a private clinic in Peterborough, has the first open MRI scanner in the East of England and consultant radiologist, Hany Elmadbouh, regularly carries out MRI scans on a wide range of patients. The open MRI technology allows for a spacious, more relaxed scan, often alleviating any claustrophobic fears patients may have. Being open on three sides, you have a clear, unobstructed view of your surroundings and can even be accompanied during your scan. Why might I need an MRI scan? There are many reasons why you might wish to have a MRI scan, but the most obvious are to provide a more detailed look into your symptoms, investigate an injury, diagnose a disease or find out more about a medical condition. Patients also self-refer themselves to get peace of mind regarding particular health concerns they may have. What can I expect when I arrive for my scan? An MRI scan is routinely done as an outpatient procedure and is unlikely to require any advanced preparation. It is best to wear clothing that does not have metal parts; including zips, buttons and clasps. Before your scan, you may be asked some questions about your health, previous operations, allergies and any medicines you are taking. What do I have to do during an open MRI scan? In a similar way to a closed MRI scan, you will need to lie still for the duration. It will take in the region of 45 minutes to complete and your radiographer will be able to see and hear you throughout. The open MRI scanner is a lot less noisy, making for a more reassuring experience. Will I be alone during my scan? Ordinarily, you would be on your own whilst an MRI scan is carried out; albeit in full communication with your radiographer. However, when undergoing an open MRI scan, you can be accompanied by a friend or relative if you are particularly anxious. Just ensure they are assessed in advance to make sure it is safe for them to do so. Will I be told the results of my scan straightaway? Avicenna offers a one-stop, same-day service for MRI scans. This means you can take away a full report, including images, on the same day as your scan. 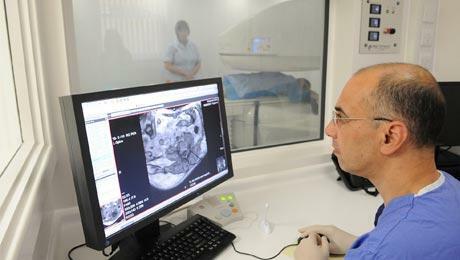 The radiologist will talk through your results at the time, answering any questions you may have. A copy of the report will also be sent to your GP or other medical professionals straight away. Is an MRI scan safe? MRI scans do not provide exposure to any radiation making them one of the safest types of imaging procedures. MRI imaging, however, uses a very powerful magnet and would therefore be unsuitable in certain cases, including if you are pregnant, have a pacemaker, have recently had surgery or have any type of metal implant. Highlight any concerns to your radiographer in advance. Avicenna Clinic is an independent, consultant-led, private healthcare practice. The clinic offers self-pay and insured patients the opportunity to receive the best, personalised healthcare at a time to suit them.